In this Japanese name, the family name is Ugaki. Matome Ugaki (宇垣 纏, Ugaki Matome, 15 February 1890 – 15 August 1945) was an admiral in the Imperial Japanese Navy during World War II, remembered for his extensive and revealing war diary, role at the Battle of Leyte Gulf, and kamikaze suicide hours after the announced surrender of Japan at the end of the war. Born in Akaiwa District, Okayama (now part of Okayama city, Okayama prefecture), Ugaki graduated from the 40th class Imperial Japanese Naval Academy in 1912. He placed 9th out of 144 cadets, and served as midshipman on the cruisers Azuma and Hirado. He was commissioned as ensign on 1 December 1913 and was assigned to the battlecruiser Ibuki. He subsequently served on the battlecruiser Kongō, cruiser Iwate and destroyer Nara. After his promotion to lieutenant on 1 December 1918, he attended naval artillery school, and was assigned as chief gunnery officer to the destroyer Minekaze. In 1924, Ugaki graduated from the 22nd class of the Naval Staff College, and was promoted to lieutenant commander. After a brief posting aboard the cruiser Ōi, he served three years as a staff member of the Naval Gunnery School, and was then appointed as a resident officer in Germany from 1928–1930, with the rank of commander. 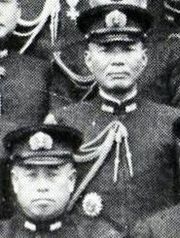 After his promotion to captain on 1 December 1932, Ugaki served as an instructor at the Naval War College. In 1935, Ugaki was assigned as a staff officer to the Combined Fleet for a year before he was given his first command: the cruiser Yakumo. The following year, he was given command of battleship Hyūga. Ugaki became rear admiral on 15 November 1938. Following Japan′s entry into World War II in 1941, Ugaki was appointed Chief-of-Staff of the Combined Fleet under Admiral Isoroku Yamamoto in which he served until 1943. He was promoted vice admiral on 1 November 1942. Traveling with Yamamoto in a separate bomber, both aircraft were shot down on 18 April 1943 over Bougainville in the Solomon Islands, in what the United States named Operation Vengeance. Yamamoto′s aircraft crashed in the jungle, while Ugaki′s fell into the sea. He was one of three survivors. After he recovered from his wounds, Ugaki was placed in command of the 1st Battleship Division (Nagato, Yamato, Musashi) during the disastrous Battle of Leyte Gulf, including the Battle of the Sibuyan Sea on 24 October, and Battle off Samar on 25 October 1944. Two of Ugaki's good friends (and Naval Academy classmates), RADM Tamon Yamaguchi and VADM Yoshio Suzuki, were killed in action during the Pacific War. Yamaguchi chose to go down with aircraft carrier Hiryu at the Battle of Midway in June 1942, while Suzuki was killed when battleship Kongo was torpedoed and sunk by an American submarine in November 1944. Ugaki's diary Fading Victory notes of his sorrow that Suzuki was not among Kongo's survivors. Recalled to Japan in February 1945, Ugaki was appointed commander of IJN Fifth Air Fleet based in Kyūshū and overseeing all naval aircraft in the province from his headquarters in a cave bunker to protect him from the growing threat of B-29 Superfortress attacks. In March, he launched the first wave of kamikazes against the U.S. fleet anchored at Ulithi followed by Operation Ten-Go in March, which involved hundreds of kamikaze attacks against U.S. Navy ships in the vicinity of Okinawa. Meanwhile, he gathered even more aircraft and hid them to be used in the same fashion in defense of Kyūshū against the expected Allied invasion that was sure to come. Ugaki planned to hit the invasion forces with hundreds of aircraft and suicide boats in a few hours in Operation Ketsu-Go (Decisive Operation). Admiral Ugaki posing before his final kamikaze mission. On 15 August 1945, Emperor Hirohito made a radio announcement conceding defeat and calling for the military to lay down their arms. 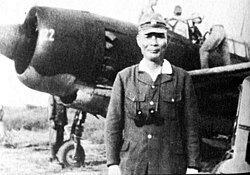 After listening to the announcement announcing Japan's defeat, Ugaki made a last entry in his diary noting that he had not yet received an official cease-fire order, and that as he alone was to blame for the failure of his valiant aviators to stop the enemy, he would fly one last mission himself to show the true spirit of bushido. His subordinates protested, and even after Ugaki had climbed into the backseat of a Yokosuka D4Y, Warrant Officer Akiyoshi Endo—whose place in the kamikaze roster Ugaki had usurped—climbed into the same space that the admiral had already occupied. Thus, the aircraft containing Ugaki took off with three men, as opposed to two each in the remaining ten aircraft. Prior to boarding his aircraft, Ugaki posed for pictures and removed his rank insignia from his dark green uniform, taking only a ceremonial short sword given to him by Admiral Yamamoto. Endo served as radioman during the mission, sending Ugaki′s final messages, and a final message at 19:24, reported that the plane had begun its dive onto an American vessel. However, U.S. Navy records do not indicate any successful kamikaze attack on that day, and it is likely that all aircraft on the mission (with the exception of three that returned due to engine problems) crashed into the ocean, struck down by American anti-aircraft fire. The next morning, the crew of American landing craft LST-926 found the still smoldering remains of a cockpit with three bodies on the beach of Iheyajima Island. The third man, his head crushed and right arm missing, wore a dark green uniform and a short sword was found nearby. The sailors buried the bodies in the sand. Hoyt, Edwin (1993). The Last Kamikaze: The Story of Matome Ugaki. Westport, Connecticut: Praeger Publishers. ISBN 0-275-94067-5. Sheftall, M.G. (2005). Blossoms in the Wind: Human Legacies of the Kamikaze. NAL Caliber. ISBN 0-451-21487-0. Thomas, Evan (2007), Sea of Thunder: Four Naval Commanders and the Last Sea War, New York: Simon and Schuster. Ugaki, Matome (1991). Fading Victory: The Diary of Ugaki Matome, 1941-1945. Pittsburgh, Pennsylvania: University of Pittsburgh Press. ISBN 0-8229-3665-8. Nishida, Hiroshi. "Ugaki, Matome". Imperial Japanese Navy. Retrieved 2006-06-14.